When I saw recently that Goodbye to Language had been added to Netflix Canada, I wondered whether there would even be a point to a 2D viewing. Godard’s 42nd feature film is notably his first in 3D, and having seen it through the glasses at two different film festivals (incidentally using two different 3D technologies) I can confirm that it is very much about its own experimentation with the format. But it turns out that a 2D viewing is fully engaging in its own way—flattening the image makes it less disorienting, which clarifies the overall structure. That said, you’ve got to have tolerance for obliqueness if you’re to enjoy Godard’s late period in the first place, so it’s generally best not to expect to understand all the referencing on first or second viewing. And really there’s no harm or shame in seeking out an explanation of the structure of the film, any more than there is in reading the Bloomsday Book in order to figure out the plot of Ulysses. To illuminate the framework of the film is not necessarily to reduce it, but still those who prefer films with neater, more explainable puzzles are probably best served by sticking with Christopher Nolan. Film Socialisme, on the other hand, has always struck me as a perfect Netflix film. 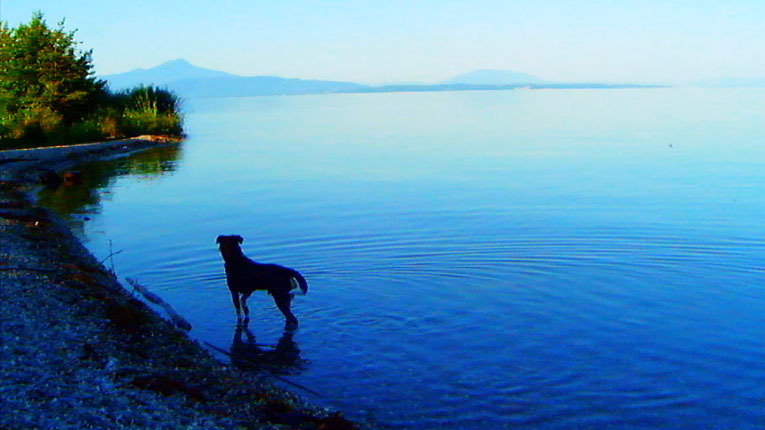 Godard’s first HD video feature, it screens really nicely on flatscreen TV or on a tablet or laptop with headphones. I especially recommend the latter approach for appreciating the inventive/experimental sound mix. That said, what makes this film a must-see, quite apart from its pure creativity, is the unplanned aura of tragedy that hangs over the entire first part of the film—due to its having been filmed on a cruise on the Costa Concordia. Other highlights include a cameo appearance by Patti Smith and an enigmatic turn by a llama (possibly one-upped in Goodbye to Language by Roxy the dog). As a study of civilization itself, it manages to be cryptic, dogmatic, and self-deconstructing all at once, but who would expect less from the most challenging director still working?